******PLEASE NOTE***** . The technology of today’s wax’s and polymers contain Nano particles that are designed to bead up water and make it dissipate from the surface. Decals will not stick to the window or surface if ANY residue from wax or rain-x or other chemicals remain on the window. The Larger Decals are not designed to be left rolled for long periods of time. Please install your decals as quickly as possible to prevent wrinkles that may occur in the shipping process. If the decals site for long periods of time without being installed it can make it extremely difficult to install, humidity and temperature fluctuations can prevent the decal from wanting to separate from the backing and or carrier papers. We do not offer replacements on orders that are left sitting without being installed longer than 30 days. Failure to follow these direction can cause damage to your decal and is not covered under replacement policy. 1. 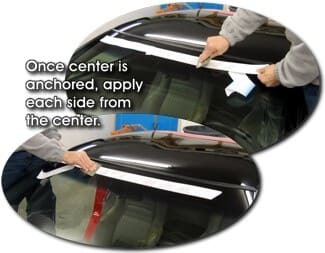 Place decal on a hard smooth surface face up and rub over the decal with a credit card, squeegee or your thumb rub firmly with heavy pressure. 2. Clean surface thoroughly with alcohol then a clean dry cloth or paper towel. 3. Starting at a corner SLOWLY Peel off the backing AT A ANGLE away from the installation tape, IF ANY PART OF THE DECAL remains attached to the backing paper as you are peeling it away lay the tape back down on to the backing and firmly re-rub over the decal. Once decal is removed from the backing paper move on to next step. 4. 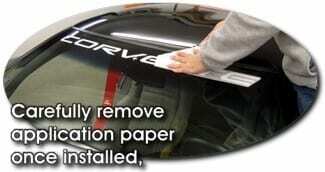 Place the decal on the glass or other smooth surface where you want it to stick, IT WILL STICK INSTANTLY. 5. 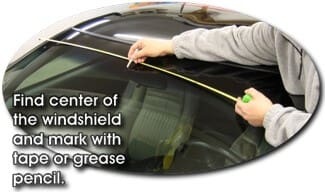 Rub over the installation tape with a credit card, Squeegee or your thumb using heavy pressure working out any bubbles that may have formed while placing the decal on the surface. 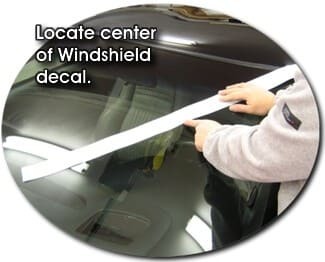 Window Decals are cut from sheets of sign vinyl and are not designed to be left for long periods of time without being installed. Please install as soon as possible to avoid issues during the installation. LARGE DECALS Body Side Graphics etc. 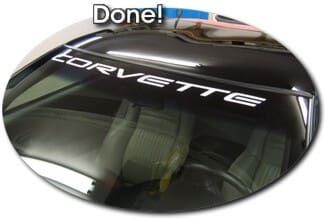 It is recommended for large decals and windshield decals be installed by a professional they can be time consuming and require patience to install properly to get the decal straight and without air bubbles. Fluting can occur in shipping due to different weather conditions and humidity. IF this occurs lay the decal on a hard smooth surface. Tape on end of the decal to the surface. Peel the decal and the application tape away from the backing starting at the non taped end. The slowly lay the decal back down on the backing paper. This will remove any fluting from the decal being rolled in the box. 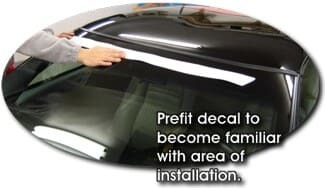 Please ensure the temperature of the decal and the installation surface is above 70 degrees, this will aid in the bonding process. 7. Slowly peel off the installation tape pulling gently at a angle. 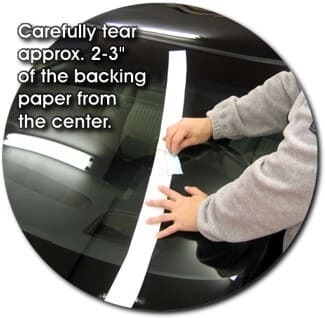 (if the decal tries to stay attached to the installation tape lay the tape back down and apply heavy pressure using your thumb, a credit card or squeegee) If you still have issues with the decal not adhering, use a hair dryer to warm the vinyl. Different temperatures and humidity levels in different regions can play a factor in the peeling of the installation tape. 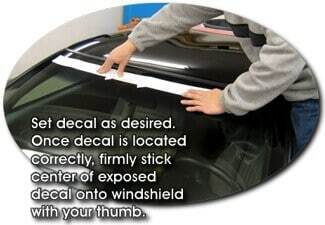 recommended when applying vinyl decals or lettering. Decals are not designed to be left rolled for long periods of time. Please install your decals as quickly as possible to prevent wrinkles that may occur in the shipping process. these recommended procedures in decontaminating and preparing the surface prior to any vinyl product installation. 2. Finish up the cleaning process by wiping down the entire area with Isopropyl Alcohol (rubbing alcohol). To avoid recontamination during the final cleaning step, wipe the surface in just one direction, using a clean, lint-free towel or cloth. You are now ready to apply the vinyl. Surface temperatures should be between 50 and 90 degrees Fahrenheit before attempting the installation. As a general rule, if the surface is hot to the touch it’s over 90 degrees Fahrenheit. Adhesive becomes brittle when it gets too cold and gummy when it gets too hot. Applications outside the recommended range of 50 to 90 degrees Fahrenheit reduce the adhesives’ ability to perform. very important. Please use your thumb or a soft, non-marring tool to apply pressure such as a squeegee or credit card. 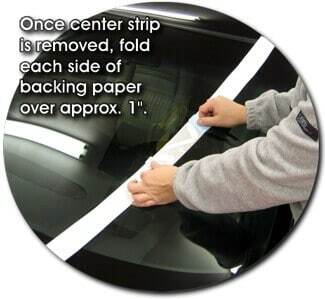 After removing the decal from the box and Prior to installation, lay the decal on a hard smooth surface and apply pressure swiping across the decal starting in the center and working your way outward to assure proper adhesion of the decal to the transfer tape and to remove any roll patterns that may be in the application tape from shipping. all mirrors are placed at exact windshield center. Decals can not be re-positioned after installed they can be removed without damaging the wall or paint by simply using your finger nail to start peeling a corner and remove the decal. **NOTE** Wall decals must be installed on a CLEAN SMOOTH WALL or the decal may not stick. Any residue from smoking or household grease from cooking will prevent the adhesion of the decal to the wall. Please ensure the wall is cleaned from any residue. No refunds or exchanges will be given on wall decals for failed installation. How do you remove the window decals? I’m getting ready to buy 3 from you but want to know how they can be removed later on. Simply, use your finger nail to start a edge pulling up and then peel them off. Clean any remaining residue with windex.